Fly Fee my sweet boy. You have no idea how your post tugs at my heartstrings. It's been three years in November that Misty walked out of my life (never again will I have a Husky I allow off lead!) I keep looking across the desert hoping she'll come home! What an awesome way to honor Smokey. 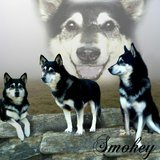 Both my Huskies passed away last year, both in the same month...the tears still fall and I still have trouble breathing, feel my heart beating too fast, whenever I think about them. I thought writing a memorial for them would help me honor them and hopefully help me deal with things better (get some sort of closure) but whenever I start it, it becomes too much for me. I admire you for your touching way to honor your beloved Smokey. Thank You both. I also released half of his ashes on his anniversary in the most beautiful spot in wisconsin called devils lake its a perfect place for him to be free.